Our official web version of Bridge Base Online (BBO) introduces a new voice enhancement to benefit teaching tables, partnership bidding tables, and vugraph. 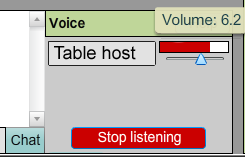 When joining a table with voice enabled, listeners see a Voice menu at the right of the chat area where the names of the speakers are displayed. Click the "Start listening" button to hear the speakers. Listeners have the ability to control the volume of each speaker individually. Click and drag the slider next to a speaker's name to turn volume higher or lower. 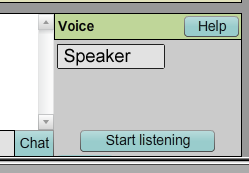 User names who are not currently authorized to speak at the table will see a button labeled "Request to speak" only if the table host has checked "Allow applications" in the "Speakers" dialog box. As it is with all table settings, the table host decides how the voice feature will be used at their table. Log out and then log back in, sometimes it helps.